‘His Majesty’ Pecorino Toscano fresh is produced exclusively with sheep’s milk coming from pastures in Tuscany and bordering territories as determined by the regulations of production. Rich in tradition, it is famous around the world for its fresh, delicate flavor. When young, under the light yellow rind, this enchanting cheese has a sweet flavor and milky aroma, notes which evolve during aging towards a more intense, structured flavor and a surprising aromatic complexity. Pecorino Toscano PDO fresh has a soft paste, with a maturation period of minimum 20 days (usually extended to 45/60 days) and a weight of about 2kg. 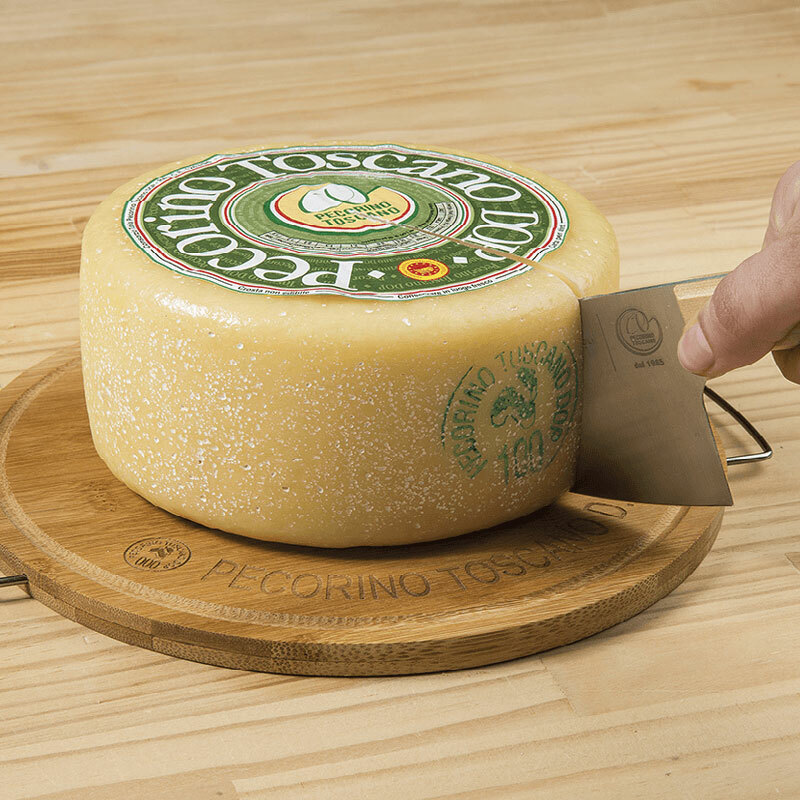 Pecorino Toscano is produced in a round wheel prominently displaying the brand of the Consortium of Production on the side, indicating the PDO- Denomination of Protected Origin, written in ink. It has a thin yellow rind, uniform, smooth, and soft. The paste is white/clear yellow in color, presenting some small irregular eyes, well distributed. The aroma is well perceived, delicate, of butter and hay. The flavor is immediately and decidedly sweet and extremely clean. The paste is soft to the touch, not dry, and does not stick to the fingers. On mastication, the paste is slightly elastic, partially consistent, without being tough. Pecorino Toscano fresh is a soft cheese, with milky aromas, quite suitable for young consumers and for those who love delicate flavors. Tasty on its own as a table cheese, it may also be enjoyed in many ways, in hors d’oeuvres, paired with honey, marmalades and caramelized fruit, or blended into delicious salads with the addition of extra virgin olive oil. When enjoyed fresh it presents its signature quality of cheese made from sheep’s milk which is transformed through art and technology into a delicate, ‘refined’ product different from other pecorino cheeses which otherwise present a strong flavor tending towards sapid and spicy.